last week in atlanta was restaurant week, so you can bet our group was ready to try some great food at great prices. i had my brother kyle help me choose the spot, and we decided on poor calvin’s. i mean, isn’t that name just great? i think so, too! this quaint restaurant on the edge of downtown atlanta has been around since november 2012. owner and chef calvin phan came to seek bigger things in our fair city, hoping to find an appreciation for his unique and innovative international perspective. his vietnamese roots, germanic training, and swiss experience have turned out some amazing dishes here at poor calvin’s. eastern flavors and western techniques come together in what they call “absolute fusion.” the cuisine has asian flavors, thai roots, and southern accents. honestly, it was an easy choice to come here. i arrived a tad early to confirm our reservation and helped myself to the bar. a drink is a great way to start a meal! i didn’t want anything too plain or expected, so i took a look over the specialty cocktails that were being offered that night. 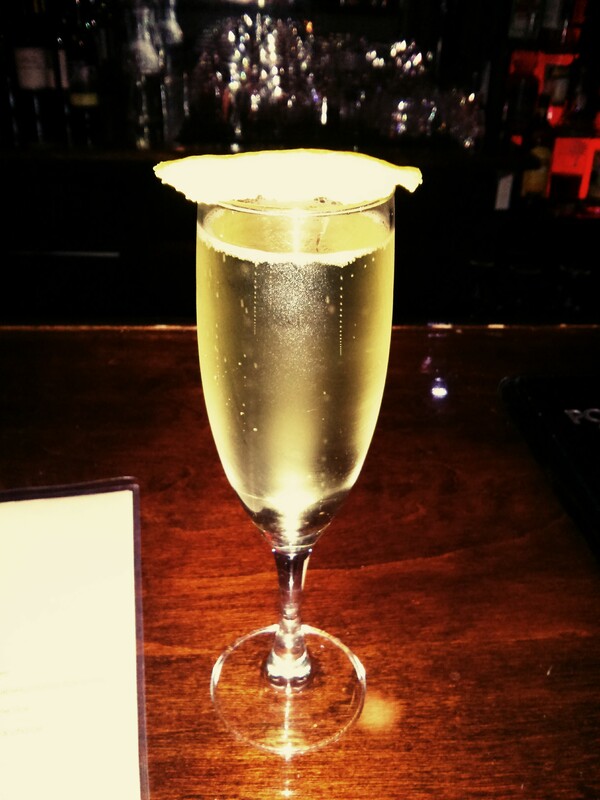 the summer’s ray, with its sparkling wine and basil vodka and st. germain, seemed to be calling my name. the bartender kindly brought it over a few minutes later. look at how happy this drink is! the citrus flavor could not be mistaken, but i make this next statement with caution: perhaps it was too bubbly? i know! slander! i love champagne, how can i say such a thing!? i liked the flavor of the drink, but it wasn’t one i was ready to order again. i would, however, have ordered the red sangria. kari had a goblet of sangria during her dinner. she let me have a sip, and it was divine. i highly recommend it. brett really enjoyed the jasmine’s manhattan he ordered. the 12-year-old whisky and jasmine liqueur were a strong and delicious combination. quite a man’s drink, if you ask me. do not fret, though! the menu has a good mix of drinks for both girls and guys, so you’ll be in fine shape if you decide on a specialty. kyle, kari, brett, and i were seated at our long 14-person table. almost another record-breaking nrw last week! poor calvin’s isn’t a huge restaurant, but the atmosphere is quite hip and trendy. it was bustling with guests and waiters when we were there, so you can imagine it was a bit loud. even though it’s a busy spot, you could easily treat your next date to brunch or dinner here. most definitely. the rest of our party arrived one-by-one and two-by-two. we were quite a crowd! i was elated to have everyone come out to such a fun restaurant, and it’d been such a while since we had a strong showing. the evening was full of laughter and good stories and even better company. i count myself quite lucky to have people such as these around me. after the first round of drinks, we had a monstrous menu to tackle that night. everyone got to pick an appetizer, entrée, and dessert. the selections are diverse and are definitely some good bang for your buck. you could go with the $25, $35, or $38 menu, depending upon how rich your tastes were. course one arrived in front of us all and nearly everyone’s eyes doubled in size as we saw our appetizers. everything look insanely delicious, and i think it all delivered. vinh and i both had the fried goat cheese. i mean, how can you pass up something with kale mashed potatoes, a fried green tomato, an onion ring, and curry mustard? that’s what i thought. there was a generous heap of goat cheese inside that big puff of deliciousness, and the crispy outside was quite flavorful as well. an interesting combination of ingredients, yes. i almost shared a couple of bites with hesitation! speaking of vinh, let me take a moment to tell you this fact: vinh was the dinner winner at poor calvin’s. everything he ordered was outstanding, and he was the food champion. such a good eye for good food! even the grape smash (which has hennessey, pressed grapes, and brown sugar) was delicious. i mean, it was so “stupid good” i wish i had ordered it. 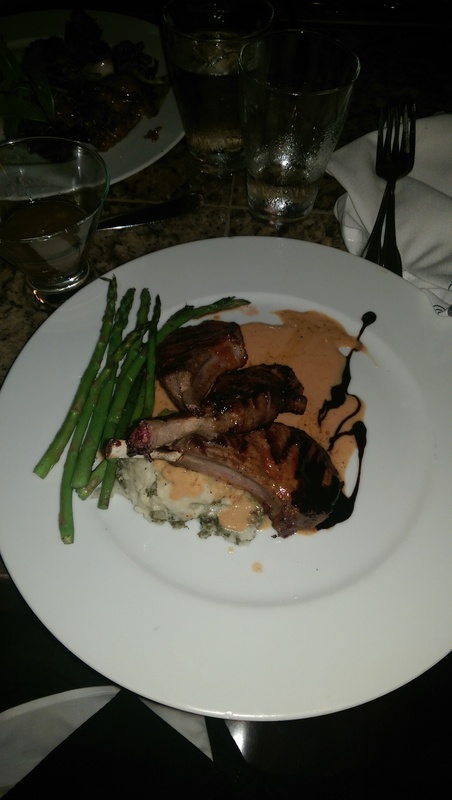 and i’m going to spoil it for you right now – vinh ordered the grilled lamb rack. son, he licked those lamb bones dry! he was quite a dinner champion, and we all knew it. some other appetizers that the table sampled that night were the steamed chicken and pork dumplings, fried calamari, and the lobster macaroni and cheese. i will say they were all quite rich and quite delicious. steamed chicken & pork dumplings. onto the dinners we go! there was a pretty good mix of dishes for our group, but let’s highlight some of the winners. first, bank saw the duck dynasty on the menu and quickly decided on it. he may have eaten it more quickly! he shared a small bite with his wife liz and wasted no time in finishing the whole meal. 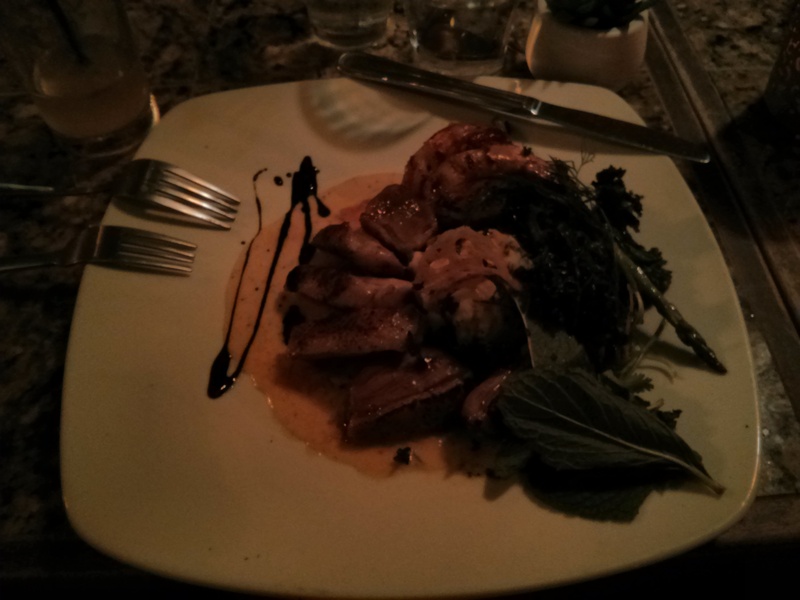 even though he wasn’t crazy about the kale mashed potatoes, the duck and tiger shrimp were perfectly cooked to his liking. 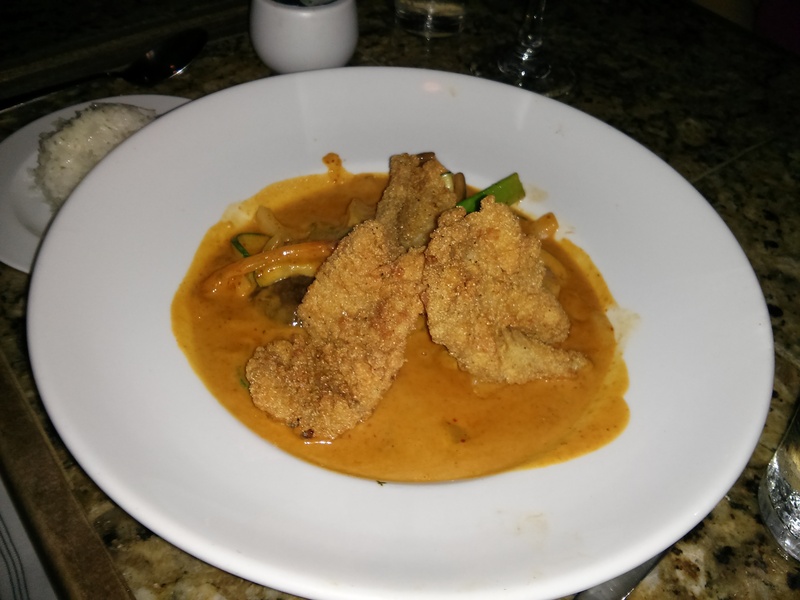 brett absolutely loved the red grouper thai curry. the group was fried to perfection, and the curry sauce was spicy but enjoyable. he ate the entire bowlful and would gladly have it again. although i tried to stray and try something a little more unusual, i stuck with what i love. 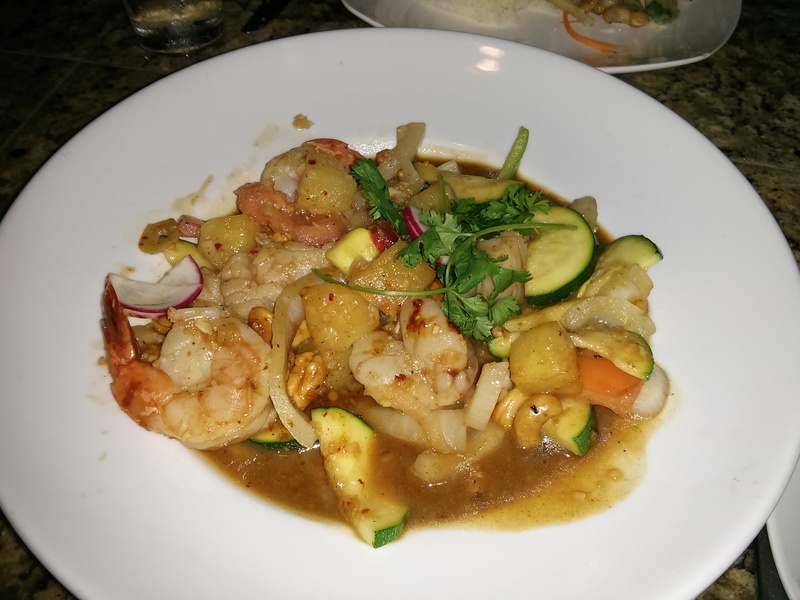 the siam black tiger shrimp and scallop stir-fry seemed too tempting to pass up, and i am glad i didn’t. the pineapple was nice and sweet, the cashews were the perfect addition for texture, and the sweet chili herb sauce was perfect atop it all. the shrimps were nice and big, and although the scallops were a bit lost among all the other ingredients, i enjoyed them as well. i, of course, couldn’t finish the whole bowl, so it was delicious as leftovers the next day at the office. yum! 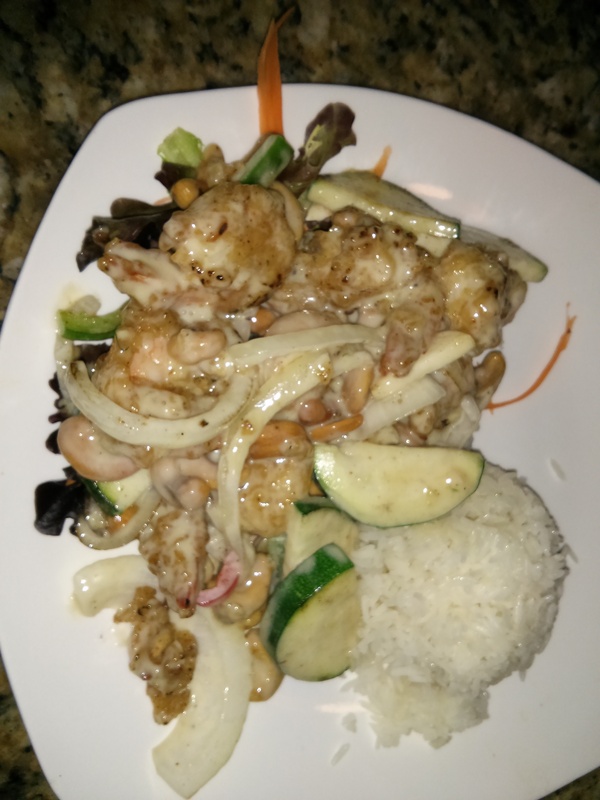 siam black tiger shrimp & scallop stir-fry. around the table, it seemed to be the general consensus that everything was wonderful. the crispy beef was ordered by several folks, and i have to admit that it looked delectable. the next time i go, though, i’ll probably end up with the fried chicken, because who doesn’t want fried chicken nuzzled in a bed of fried rice? you get my point. also, i cannot remember what my brother ordered, but he really liked it. if you can show the waiter this picture when you come to poor calvin’s, perhaps he can identify it for you. it had been a long meal, and the yawns were being passed around the table, but the best course was on the way: dessert! it was the chef’s choice that night, and i think we were all delightfully pleased with the chocolate mint cake and berry crepe. they were sweet and tasty but not too heavy, which is a good thing considering all the food we had already eaten. after paying our tabs to the waiter jay (who, by the way, was excellent all night, as was all the wait staff), we all shuffled out into the cool evening air. another successful nrw dinner in the bag and another fantastic evening with good friends. i’m sure it could get better, but in that moment, things seemed pretty swell.